Images purporting to show off a camera component and another piece of a supposed "iPhone 5S" have hit the Internet, fanning the rumors that Apple's follow-up to the iPhone 5 is on deck. 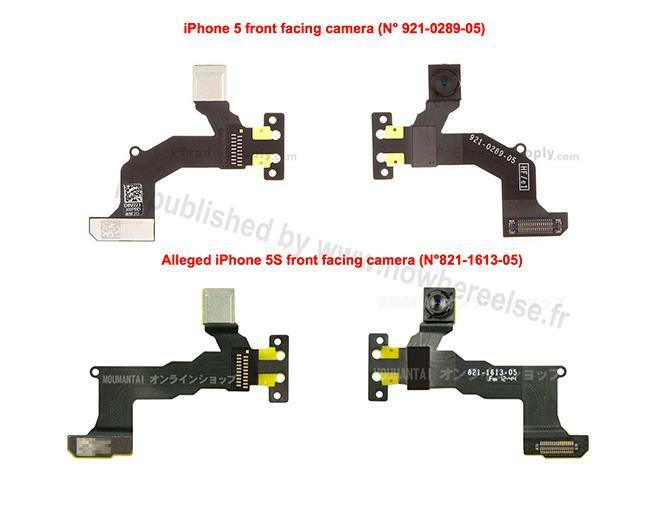 One of the components featured in the supposed leak is what appears to be a front-facing camera, similar in appearance to the one built in to the iPhone 5. The serial number shown on the "leaked" part is similar to the one seen on the iPhone 5 part, notes NoWhereElse.fr. The flexible portion where the component connects to a motherboard, though, is apparently quite different from the one seen on the iPhone 5 component. Friday's report also brought images of another supposed component, though its function is unclear. The same site previously leaked components that went into Apple's new Lightning connector, and the site has shown off other parts said to be from an "iPhone 5S" or an "iPhone 6," as well as a supposed cover glass surface from a fifth-generation iPad. The new images appear to add to the rumors that Apple will bring a rapid follow-up to its iPhone 5, iPad, and iPad mini, and possibly introduce a lower-cost iPhone model in the near future. Currently, rumors have the Cupertino company releasing new devices some time over the summer.